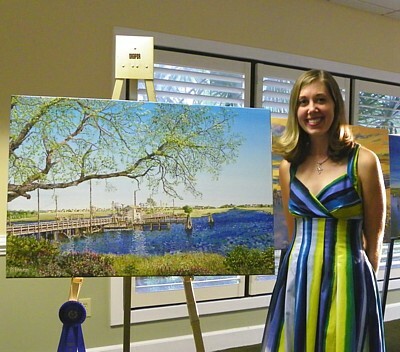 Meredith Hannon of Herndon, Virginia, stands beside her painting of the Sunset Beach Pontoon Bridge. It was chosen as the official Town painting of the bridge and hangs in Town Hall. To order print(s) of this painting, please contactl Meredith directly at andersml@gmail.com or click here: http://www.etsy.com/listing/59168620/sunset-beach-pontoon-bridge-giclee-print.